A warm, inviting, and heartfelt collection of recipes and celebrations to re-create and share with your own family. A few years ago, Jaime Richardson did what a lot of young, articulate, creative women were doing: she launched a blog (sophistimom.com) where she could reach out to other young mothers and share ideas about feeding and raising healthy, happy children. What started out as a place to express herself quickly grew to a destination of choice for those eager for fresh ideas and creative inspiration for their own families, garnering the attention of The Pioneer Woman, Glamour Magazine, and Babble.com, where she has been named one of the Top 100 Mommy Food bloggers for three years running. She is also part of Martha's Circle, a small group of lifestyle bloggers, hand picked by the editors at Martha Stewart. 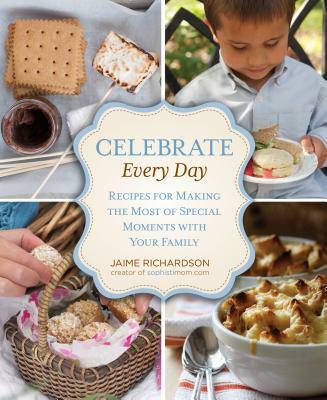 In this cookbook, Jaime focuses on the heart and soul of her blog: recipes for making the most of special moments with your family. According to Jaime, celebrating really isn't about the events but about the moments. And big or small, these are to be enjoyed with great food and lovely, simple touches of sophistication that everyone in the family can appreciate. Featuring twenty unexpected, wonderful celebrations that any family can enjoy, the book offers original ideas for making the most of time spent with children, including suggestions for activities, books, and music that go along each theme. Some 150 full-color photographs showcase the approximately 100 finished recipes as well as the author's three adorable children. Organized by season, the book offers ideas for such gatherings as: Welcome Spring Brunch, Berry Picking Party, Back to School Breakfast, Fireside Supper, and a Rainy Afternoon Feast. Jaime Richardson grew up in a coastal town south of Boston, where she learned to value classical music, literature, long walks on beaches, and fried scallops. Her love of food photography began at Brigham Young University where she earned a Bachelor's degree in design and bought her first copy of Martha Stewart Living Magazine. When she began her family, she became troubled by the amounts of artificial ingredients in the food readily available, and turned her attention to cooking and baking from scratch, learning the majority of her skills from cooking programs and food magazines. She rarely followed recipes exactly and ended up creating many of her own original dishes. As a way to keep a record of the recipes she created, and as a place to share her musings of raising her children to share her love of all things sophisticated, she began her blog Sophistimom in July of 2008. Since that time, Sophistimom has earned awards from around the web, including being named one of Babble.com's Top 50 Mommy Food Bloggers in 2010, and then again in 2011. Sophistimom has earned the attention of The Pioneer Woman, where her food was featured on both ThePioneerWoman.com and TheTastyKitchen.com. She is featured in the book Where Women Cook: Celebrate! : Extraordinary Women & Their Signature Recipes (Jo Packham, Lark Crafts, October 2011). Her work has appeared on Gourmet Live, Gourmet Magazine's daily blog, Glamour Magazine's Health blog, and in Dessert Magazine. Jaime was a food writer and photographer for Babble.com on their food blog, "The Family Kitchen." Her recipes have appeared in Martha Stewart's Everyday Food magazine, as part of Newman's Own "Own It!" campaign. She is part of Martha's Circle, a small group of lifestyle bloggers, hand picked by the editors at Martha Stewart. She lives with her family near Salt Lake City, Utah.